It may not be swimsuit season yet, but we’re already dreaming of warmer and skimpier days to come. To insulate our brains from the worst part of winter (post-holidays, still cold), we’ve decided to focus on a swimwear tournament. 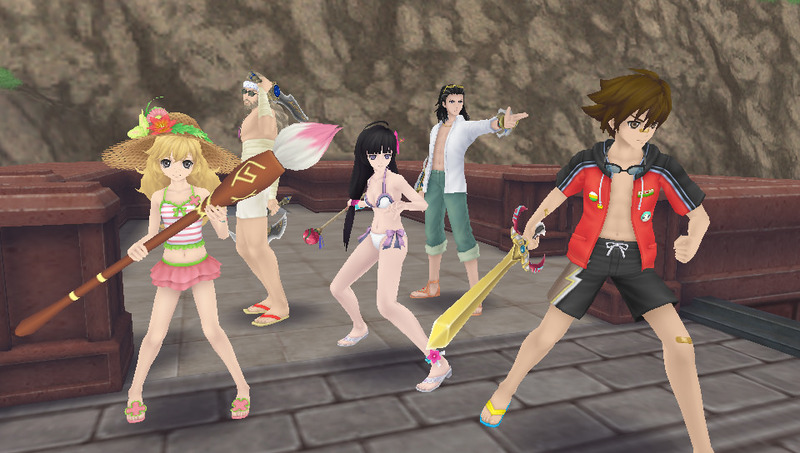 Who better to make up the challengers than the costume- and beach-loving casts of the Tales series? Our bracket consists of eight Tales games: Tales of Hearts, Tales of the Abyss, Tales of Symphonia, Tales of Vesperia, Tales of Xillia, Tales of Xillia 2, Tales of Graces F, and Tales of Zestiria. Our first match-up is Tales of Hearts vs. Tales of the Abyss. First, a disclaimer. I think the Tales of the Abyss outfits are technically used for a hot spring, so Jade wearing a bathrobe isn’t totally inappropriate. But most of the other outfits seem more beach-ready than spa-ready. The girls, and Guy in particular, seem to be ready for a dip in some sort of body of water. Unfortunately they’re kind of plain. I also don’t approve of the head towel on Luke. Head towels are never appropriate. 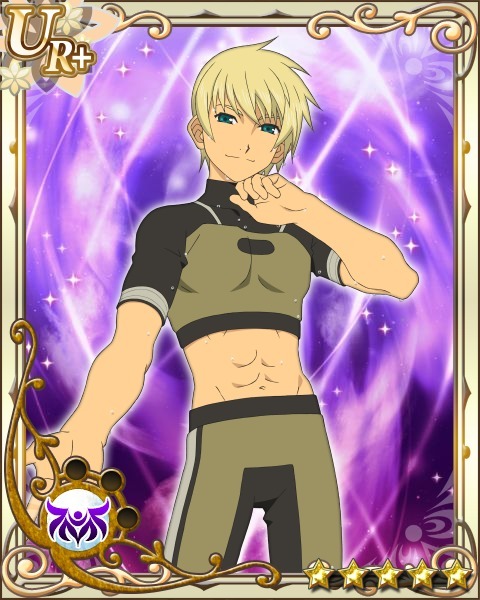 Meanwhile, the Tales of Hearts crew seems to be more on point with the summer selections. The only thing that is appalling to me is the straw hat on Beryl. Just wear some sunscreen like everyone else. My vote goes to Tales of Hearts. I like all of the Abyss crew’s outfits with two major exceptions. First, the positive standout here is Natalia: her usual outfit is so stuffy and dull that it’s nice to see her loosened up and relaxed. Her swimsuit has a gypsy dancer vibe and I love her hair tucked up under the scarf. Plus, that girl is built! Look at her muscular back! Jade pulls off the robe well: he’s what, 30?, which is “crazy old” in Tales standards, so a robe and slippies are appropriate for his age. Anise’s summer dress and shorts look super comfortable and breezy. Luke is pretty forgettable: unlike Joey, I can forgive the head towel since it’s probably just a cooling-off mechanism. The real issues here are Guy and Tear. I don’t know why Guy is wearing half of a diving suit. It’s like he pre-shrunk it to show off his abs. Tear’s got some sort of crazy failed chastity belt strapped around her waist and thighs. Seriously, what IS that thing? A frilled bottom or simple sarong would have been much better. 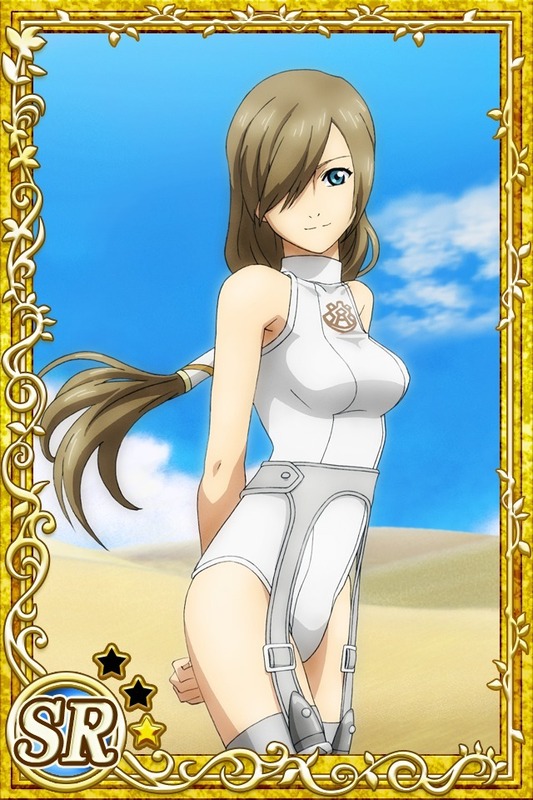 Like what Ines is wearing, which brings us to the Tales of Hearts crew. I haven’t played Tales of Hearts, so I don’t know what these people usually look like. Kor seems like he’d fit in in a Kingdom Hearts game. I like his hooded jacket since, hey, it can get chilly at the beach, but am curious what those pieces of flair are. One looks like a Hatsune Miku button, which is adorable. I assume Hisui is an almost-bad-guy who bullies Kor. He’s even pointing gun-fingers at him in this picture. I don’t think this guy was informed they’d be going to the beach: he’s just unbuttoned a dress shirt and rolled up his hipster teal pants. That gold bangle is also a rust hazard. 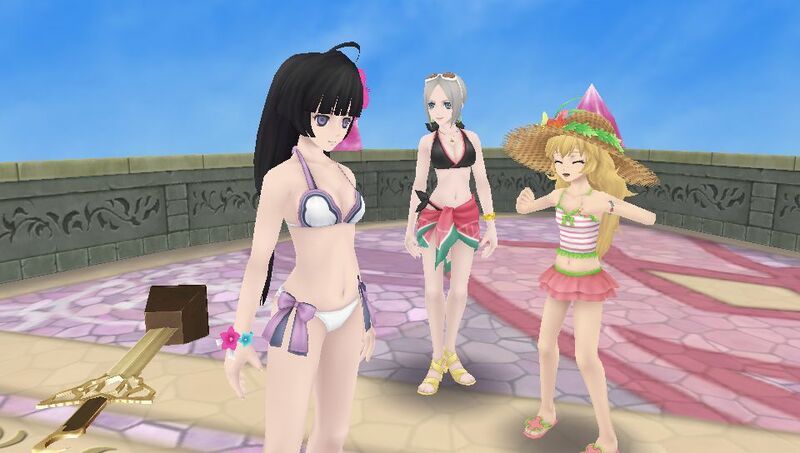 I like the swimsuit on the dead-eyed girl, Kohaku. Those are pretty massive bikini bows, but it works since the rest of the suit is so simple. I wish the pink flower in her hair was some other color since she’s got a purple color scheme going on clothes-wise. The bearded guy, Gall…is this really an outfit? He’s just wrapped in bandages. He’s probably under doctor’s orders not to get those wet, so this is not proper beach attire. Beryl is cute, I like her pink/green/white color scheme and frilly skirt. The hat is acceptable–hey, she’s super pale and probably burns easily–but it’s a bit too Miss Chiquita Banana for me. Ines is tied with Natalia for my favorite outfit: I love her simple black bikini that’s been trimmed with pink. Then the colorful sarong on top provides an optional pop with that same pink and some added teal. Only downside are her shoes, which look like gladiator heels and are going to be a pain for beach-wandering. 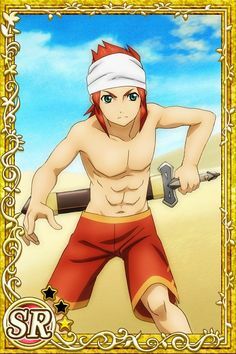 It’s a tough call since so many of the Hearts crew aren’t really beach-ready, but I hate Tear and Guy’s outfits enough to award this one to Tales of Hearts. I’m not sure I know what exactly I’ve walked in on in these two scenes. Tales of Hearts reminds me of the cast of S Club 7 getting ready to crank up the hijinks. Tales of the Abyss…looks like someone’s hungover mom (Jade) (Jade is a man?) promised her (his) kid, Anise, a pool party that will never happen. But she invited all her friends already! How embarrassing. This group is a mess, with the exception of Anise, whose little outfit has cute detailing and age appropriate coverage. Tear’s outfit reminds me of Leeloo’s bandagey getup from The Fifth Element. Luke is ready for the beach, but no one is ready for his stupid bandana. I’m glad the first picture makes it clear that Natalia’s headpiece is NOT attached to her wrap top, because it certainly looks that way in her standalone picture. The idea of that sounds so stupid that it makes me chuckle. Guy’s crop top and long biker shorts is the worst outfit out of this group, but is not outdone by Gall’s creepy getup. If this was SNL circa the late 1990s, Gall would be played by Will Ferrell. I like Hisui’s breezy beachwear and how Kor is prepared to fight foes on land and by sea (goggles around his neck). Beryl, Kohaku, and Ines have some nice suits on but that hat of Beryl’s is a little too Strawberry Shortcake for me. Despite Gall’s grossness, I’m going to award this one to Tales of Hearts.